The irony of the date was not lost on the Israelis. Resolution 181 called for the partition of the British-ruled Palestine Mandate into a Jewish state and an Arab state: 33 countries voted in favor, 13 against and 10 abstained. 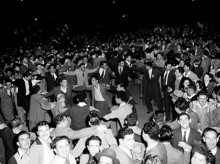 The resolution was accepted by the Jews of Palestine and set off jubilant celebrations. In a whiff of nostalgia, Israeli TV on Thursday aired grainy footage from that day of people dancing in the streets. Israeli radio interviewed Israeli seniors about their recollections from that day. After the vote, ecstatic Palestinians in Ramallah and other West Bank towns waved flags, danced in the streets and set off fireworks. A group of Israeli peace activists held a rally Thursday to support the Palestinian bid in front of the old Tel Aviv Museum, where Israel’s independence was declared in May 1948.